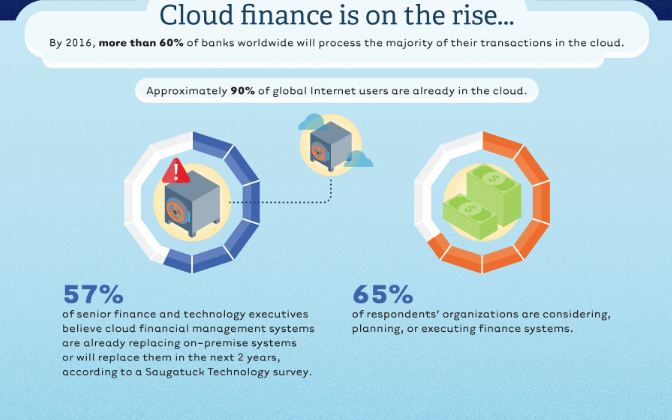 Cloud Finance is on the Rise. Here’s Why. By now, most people have realized that the safest place to store their music, photographs, and important documents is not on CDs, DVDs, external hard drives, and flash drives. 90% of global internet users realize that there is an easier, safer way with online storage in a cloud and it turns out the cloud is becoming an increasingly popular place for your finances as well. By 2016, over 60% of banks around the world will be processing the majority of their transactions on the cloud. In the infographic below, Intuit® Tax Online shows us the benefits of cloud storage and why it could be the most secure option available. Want to go green? A centralized cloud server space uses less power and produces less CO2 than individual external hard drives. Want to save green? Cloud finance offers flexibility which means lower costs for you and your customers. And it’s safer than traditional methods. According to a recent Microsoft survey, 94% of businesses saw improvements in security after making the switch to cloud computing.